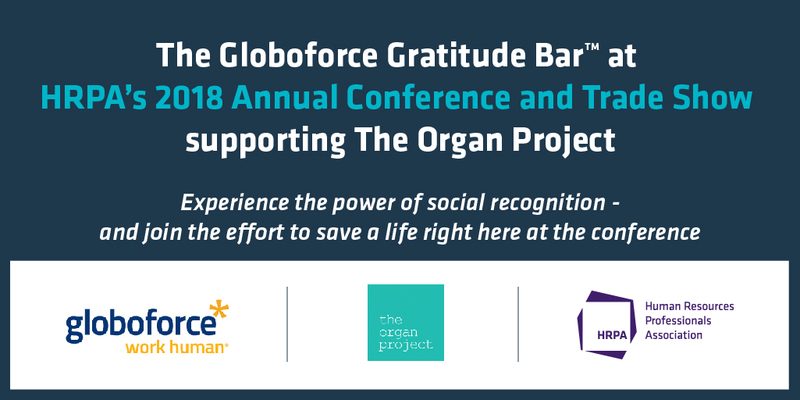 Join us for HRPA’s corporate social responsibility onsite initiative with the Globoforce produced Gratitude Bar™ for The Organ Project. Perhaps someone pointed the way to your next session. Gave you an inside tip on a fabulous Toronto restaurant. Or simply chatted with you during the Networking Lunch. Wouldn’t it be nice to recognize such moments of sharing, helpfulness, and learning? This year at HRPA, you can. Simply visit the Globoforce Gratitude Bar. There, you can recognize your peers and get a firsthand taste of social recognition during the conference. Head to the Globoforce Gratitude Bar where a staff person will help you begin the social recognition process. Search for the attendee you’d like to recognize. Select one of the values they have demonstrated, and share a couple of sentences on why you’d like to recognize them. Hit submit – and you’re done! When you receive an alert notification that your received an award, head to the Globoforce Gratitude Bar. When you redeem your award, we’ll make a charitable donation to The Organ Project on your behalf. You’ll receive a colored ribbon to hang on the charity box, symbolizing your contribution. During the conference, you can watch as the community of giving and recognition grows. You’ve now experienced the power of social recognition, Globoforce style. An attendee approached you with a smile. They made you laugh out loud. They shared a joyful moment that provided a lift to your day. An attendee made a great point during a session. They told you something you didn’t know. You learned from them. And they gave you a new perspective. An attendee was warm and welcoming, and listened to your story. You felt a sense of belonging – like a part of a group. An attendee showed you their true self. They talked about their family, their hobbies, and their other interests. This interaction made you feel genuine. Founded in May 2016 by Eugene Melnyk, the Owner and Chairman of the Ottawa Senators Hockey Club, The Organ Project is a not-for-profit entity with the single mission of ending the organ transplant waitlist. Should you ask Mr. Melnyk, why he created the organization, he would tell you “to save lives, because my life was saved”. In May of 2015, Mr. Melnyk’s life was saved by a liver transplant following months of extreme illness. Mr. Melnyk nearly died as he waited for a deceased donor. The wait had a lasting impact on Mr. Melnyk and he has committed both his time and resources to making sure others don’t have to endure that wait. Currently, over 4000 people are waiting in Canada for an organ transplant. Many will die waiting because, despite medical and surgical advances, the demand for organs is still far greater than the supply. In fact, most Canadians are five times more likely to NEED an organ transplant than they will be in the position to GIVE an organ for transplant. This demand for organs will only increase as our population ages. The supply of organs is also limited by the fact that, while more than 85% of Canadians support the idea of organ donation, fewer than 30% have registered as organ donors. The main objective of The Organ Project is to raise awareness and encourage Canadians to register as organ donors. One donor can save eight lives, so every registration counts. Pioneer of the WorkHuman® movement, Globoforce helps make work more human for millions of people and organizations worldwide. Its cloud-based social recognition software helps build award-winning cultures where employees feel more appreciated and socially connected at work – driving a sense of belonging and inspiring the entire organization to reach its full potential and achieve business success. Founded in 1999, the company is headquartered in Framingham, Mass., and Dublin, Ireland.